Muse and news on Argentine football. Reinvigorated, refreshed and revitalised...................Maradona returned from his luxury spa break in Italy this week, minus some earrings but with a list of players he hopes will see Argentina finally make it to next years World Cup. Any thoughts that 11 days of hydrotherapy, salt inhalation, reiki and 5 star pampering would mellow the under fire coach were soon put aside when he barked at plethora of microphones 'No one has instructed me to pick any players. I couldn't stand it from anyone. I'm 48 years old and nobody has imposed anything on me since I was 15. The list I bring is mine' which leaves us in no doubt who to blame if it all goes wrong. On to the players - the initial list of 18 is composed of those playing overseas - the headline, Gonzalo Higuian of Real Madrid finally gets his senior cap - Gabriel 'the scruffy kid' Heinze keeps his place as usual, I wonder if he and Higuain will be sharing a room????! Forwards: Lionel MESSI (Barcelona, Spain)Sergio AGÜERO (Atlético Madrid, Spain)Carlos TEVEZ (Manchester City, England)Gonzalo HIGUAIN (Real Madrid, Spain)Diego MILITO (Internazionale, Italy)Ezequiel LAVEZZI (Napoli, Italy). The domestic players will be finalised after Wednesday's 'locals only' game v Ghana, Ortega has been called-up! Don't think I'll be setting my alarm for that one. Although Enzo Pérez of Estudiantes gets a deserved chance as does Jesús Méndez of Rosario Central. On the subject of the Selección's return to the Monumental (remember the fuss?) Diego had a less than coded message for the cleaners, caretakers and groundsmen 'I have nothing against River. The important thing is that the dressing rooms are up to standard and the pitch is in good condition'. Remember the pitch made all the difference in Rosario. After seven competitive games in charge including 3 defeats, 3 draws and a solitary win Boca Juniors coach Alfio Basile tended his resignation on Sunday night. In the aftermath of defeat at home to Godoy Cruz of Mendoza on Sunday, Coco headed for room 707 of the team hotel to inform General Manager Carlos Bianchi and others of his intention to quit. After only a couple of months in the job he didn't believe he could improve things, questioning his own ability to motivate and connect with the team, their attitude, the depth of the squad (Rodrigo Palacio and Fabian Vargas both left in the close season) and a lack of harmony in the boardroom. Bianchi however refused to accept his resignation and set about rectifying the delicate situation , conscious also that his own reputation relies to a certain extent on Basile succeeding - mission accomplished and he's agreed to stay on. Other factors such as some ridiculous defending (particularly on Sunday), Riquelme's permanent injuries - he's out for at least the next two matches, and fatigue...........yes fatigue 4 weeks into the new season have also been blamed for the poor start. The goal now is to ensure that they secure qualification for the Copa Libertadores - on current form they are looking very unlikely. Sucessive games against Estudiantes and then Velez will prove if the confidence in the manager is justified - the board maybe begging for the resignation letter. Ushuaia is a city on the edge, located at the very tip of South America on Tierra del Fuego seventy-thousand people now reside here, surrounded by spectacular mountain peaks. The most southerly city in the world (I'll argue with anyone who considers the Chilean settlement of Peurto Williams a city) is rapidly expanding thanks primarily to tourism and also the massive cruise ships that take wealthy holidaymakers south to Antarctica - a relatively short hop over the Drake Passage. As has been seen throughout football's short history the game prospers and flourishes in tandem with the community that surrounds it. Football at the End of the World is no exception and Ushuaia has recently been accepted into the AFA fold. Ushuaian league champions Los Cuervos del Fin del Mundo and runners-up Mutual Banco made history this year by being the first teams from the city to take part in an AFA administered competition. These pioneers took part in the Torneo del Interior or Argentino C, a mammoth tournament that encompassed 264 teams from all over the country which are divided on a regional basis. The prize is a place in Argentino B, the fourth tier of Argentine football including teams other than those from Greater Buenos Aires. order to be affiliated with the AFA a condition was that we developed a Futsal league'. Each game consists of two twenty minute halves. Certain aspects of Torneo C resemble English non-league football particularly the lives of the players: 'All of the players are amateur and they fit in playing and training around their jobs. We have taxi drivers, civil servants, PE teachers, factory workers and dockers - there's even a local councillor Damián de Marco who plays for El Duende'. The teams all play at Ushuaia's municipal stadium - Hugo Lumbreras. In this year's competition the support was first and foremost Ushuaiaense in nature as opposed to split along individual team lines. In the case of the champions Los Cuervos: 'when they played in Argentino C the stands were pretty much full and they also took some fans to away fixtures'. The emergence of Los Cuervos has also attracted attention from Buenos Aires, 2400km away. At the end of June they signed an agreement with Primera A giants San Lorenzo. El Ciclón will provide expertise in the field of sports medicine/injury management, they will supply kit and training materials, there's also the opportunity for Los Cuervos to train in the capital with the pros. Squad players from San Lorenzo will travel south to join Los Cuervos and gain valuable experience. Football is pursued as enthusiastically and passionately as elsewhere in Argentina - have local players moved away to play at a higher level? 'Seventeen year old midfielder Franco Mendoza is a bright prospect, he played for Argentina Under-15's at the 2007 South American Championship in Brazil and this year he's joined River Plate'. There are other young players located at leading clubs throughout the country including Independiente, Gimnasia y Esgrima de la Plata and San Lorenzo. 'The Temporetti brothers, Francisco and Fernando played for Rosario Puerto Belgrano (Punta Alta) during the club's golden era all the way to Argentino A - they've since returned to Ushuaia with Los Cuervos'. The city's most famous son is to be found in Futsal - Alamiro Vaporaki has represented Argentina at senior level, his skill and achievements have also been acknowledged by the Argentine Sport Journalists Association. Many thanks to Esteban Parovel from El Fin del Mundo (http://www.ushuaia-deportes.com.ar/) for answering my questions. Thanks also to Fernando from Argentinesoccer.com (http://www.argentinesoccer.com/indexen.cfm?CFID=15719458&CFTOKEN=43656519) who explained the complexities of the Argentine league system to me. President Lugo of Paraguay was almost correct before Wednesday night's World Cup Qualifier when he predicted a 2-0 victory for the home side. It could have been even more as they hit the frame of the goal twice before half-time together with scoring a neat goal. As expected Maradona made changes from the team humbled by Brazil with Romero replacing Andujar in goal, Emiliano Papa, Fernando Gago and Sergio Aguero all being called into the team. Mystifyingly Sebastian Dominguez who had the debut from hell on Saturday was retained in the heart of defence whilst Nicolas Otamendi was left out. The most striking thing about this performance was Argentina's complete lack of ideas, especially after going a goal behind on how to salvage the situation given the wealth of talent on display. Paraguay's goal was well worked and expertly finished by Haedo Valdez after receiving the ball from Salvador Cabanas who was given acres of time and space to turn and turn again without being challenged. Veron was justifiably booked for a studs-up challenge on Christian Riveros, most likely born of frustration from having such a shocking first half - stuck out on the right he inevitably drifted towards the centre and looked every one one of his 34 years. Most of Messi's play was concentrated far too deep to cause any problems at all - once again the Agrentine press are questioning why he can't recreate his Barcelona form. Paraguay were content to let Argentina have the ball safe in the knowledge that they'd do very little with it. Debutant golakeeper Sergio Romero was tellingly Argentina's pick of a poor first half. Right - half-time: cuppa (maté), inspired changes by Maradona and a rousing teamtalk. Wrong - the team had the look of condemned men as they sheepishly took the field for the second half. The only change was a bizarre one Ezequiel Lavezzi on for his Napoli teamate Jesús Dátolo, one of the better outfield players over the previous 2 games. Switching to 4-3-3 Maradona hoped 3 vertically challenged, nippy, similar forwards could do the job that 2 couldn't. Soon after Veron gets a second yellow and is off for a foul on Torres - this time he's sold a short pass by Mascherano which puts him in trouble. Back to the drawing board and Argentina unleash their secret weapon - 35 year old Martin Palermo back to exorcise the ghosts of his last visit to Paraguay with la seleccion and add some much needed height to the attack, Aguero exits. One final odd substitution remained - 36 year Rolando Schiavi another debutant replaced Dominguez. Finally some urgency from Argentina in the last 10 minutes, Palermo heads back across goal and Schiavi nearly bundles it home - but doesn't. Maradona has vowed to fight on, Aguero assures the public that Argentina will still qualify meanwhile Real Madrid forward Gonzalo Higuain watches the whole campaign unravel from afar . Two games remain - Peru at home, a win (surely) and away against the old Old Enemy - Uruguay, themselves improving and looking solid. Argentina's World Cup qualification was stuttering long before Maradona was hired - appointing the world's greatest player was huge risk, his previous managerial posts had been spectacular failures - as each competitive game passes it looks like the gamble may not pay off. In the end it didn't really matter, it didn't matter that the crowd were closer to the action, it didn't matter that the playing surface was perfect, it didn't matter that Argentina were slick and incisive going forward (at least until they ran into Brazil's defence), what did matter was the home side's glaring inability to defend and in particular mark the opposition players at set pieces. Argentina's attacking prowess merely highlighted their defensive failings - Brazil held the line, stuck together and formed a wall of yellow to blunt the frequent forays forward. In contrast Argentina were pulled to pieces by Brazil's counter attacks. For the first two goals (Luisao's header and Luis Fabiano's strike) Argentina's defence were so far away and their reaction so tardy they may well have been back in Buenos Aires. At 2-0 down the fans admirably stuck with the players. Very much like the first half Argentina started the second half well although all of their efforts were concentrated through the centre where they slammed into the Brazilian wall. Midfielder Jesús Dátolo provided a small window of hope when on 65 minutes he shot fast and straight from long range as Brazil stood off him. Dátolo's celebration was a lot more restrained than that which followed his goal in Moscow, a indication of the seriousness of the situation. Less than a minute later the counter attack which finally killed off the game - Kaka's run and pass through to Luis Fabiano to chip at an angle over an advancing Andujar, as cool as you'll ever see. Game over. And what of Messi on the return to the city of his birth? He worked tirelessly and searched for openings, made probing runs and was a constant threat without any notable support - his second half jig into the penalty area was only halted by accurate Luisao tackle. The main talking point will be Maradona's decision to throw the inexperienced Velez Sarsfield pair of Sebastián Dominguez and Nicolás Otamendi into the into the defence for such a high profile game against the arguably the best team in the world. Brazil have secured their place in South Africa, for Argentina the battle is only just beginning. Can Diego win this fight? Off to Paraguay on Wednesday. 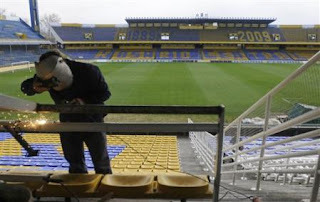 When the suits from FIFA deemed Rosario Central's stadium fit to host tomorrow evening's Argentina v Brazil World Cup Qualifier it's reasonable to assume one of the pre-requisites is fully functioning and reliable plumbing - toilets that flush, showers that are hot and water that is drinkable. It seems the CBF are not confident on the last point. If they were why on earth ship the stuff over the border. The answer of course goes back to Italia '90 and Argentina's 2nd round defeat of Brazil - the real Water-gate. Brazil's defender Branco was handed a bottle of water from the Argentine bench during a break in play which allegedly contained tranquilisers. Branco himself said he felt light headed and drowsy towards the latter stages of the clash. Argentina vehemently denied any wrong doing in what has since been referred to as the 'Holy Water' incident. Some 15 years later Maradona confirmed on a TV show that the dirty little affair had indeed taken place whilst stressing he had no direct involvement. In 1990 Carlos Bilardo was the coach of the national side, today he's Maradona's side-kick and general manager - could this be why Dunga and his side are being so cautious? 'We're going to take our own water to avoid any problems. We'll only drink our own' Brazil's Dani Alves told Argentine broadsheet La Nacion. Tomorrow's game will no doubt have it's own talking points but thankfully the preamble and endless build-up is almost over. From Adriano spouting that Argentina are 'scared of me' to World Cup winner Nery Pumpido telling us 'the crowd will play their part' many have had their say, with some comments being more enlightening than others. The main event takes place in 24 hours. Real Football Argentina by http://www.realfootballargentina.blogspot.com/ is licensed under a Creative Commons Attribution 2.0 UK: England & Wales License.